The robust AB700 is powered by the the market-leadi ng Impinj Indy R2000 reader chip for optimal read reliability and faster read rates enabling it to outperform the major brand competitors. At about half the size of the Motorola MC9090, smaller and lighter than the MC3190 and more durable (IP65) than any of its competitors, this work-horse reader outperforms every popular brand of RFID handheld on the market today. Beyond outstanding performance, the AB700 also offers more add-on features than its better known unwieldy competitors. Choose from GSM/GPRS, CDMA, HSDPA to GPS and from 2D barcode to 3.0 MP flash camera all on the same unit with UHF, WiFi and Bluetooth. 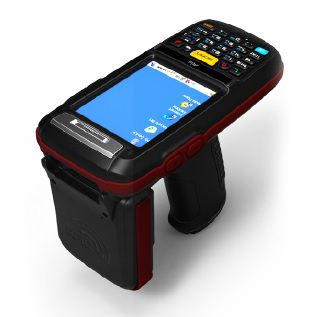 Along with higher margins for resellers this makes the AB700 the obvious choice for professional, industrial strength RFID handhelds for your top clients. The AB700′s primary internal battery offers 3.7 Volt/3,000mAH (11.1 watt-hours) and it is replaceable. The main battery is good for 12 hours with the 2D barcode imager based on 500 scans in one work day. Aside from the standard WiFi, it also supports the 5GHz WLAN. In addition to reading EPC GEN 2 Tags, the UHF model also reads ISO/IEC 18000-6B tags. If 13.56MHz is required, the HF model readsISO 15693, Mifare, ISO 14443 Type A and B tags. Additional features from the Option Price List can be added to the Starter Kit, such as gun handle w/extra battery, GSM/GPRS, GPS, 2D etc.